This elegant Colony estate is masterfully designed, offering the most sophisticated lodging experience available at the Canyons Resort. Skiing out your door to fresh powder is just one of many unique elements at this refined luxury retreat. An intelligent mixture of fashion and function is present among the 8,000 square feet of finely crafted mountain construction. With 4 luxury master suites plus den along with 7.5 bathrooms and multiple fireplaces throughout the home, this estate can accommodate a wealth of different travelers, from large family getaways to corporate retreats. The residence offers uniquely comfortable open living spaces with warmth and an ambient feeling despite in contrast with its grand size. An evenflow in the home’s floor plan creates usable space for entertaining combined with private enclaves of the home and serene master bedroom suites. 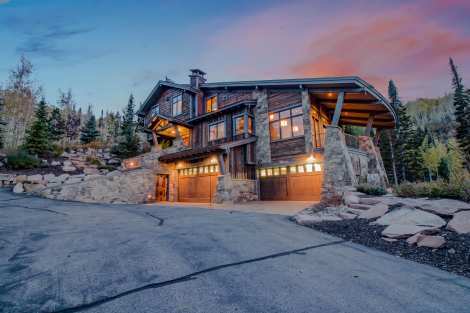 Nestled in the trees in the exclusive gated community known at the Colony, the estate is perched over the downtown area with longevity in its views of both Park City’s historic downtown area and surrounding abundant mountain scenery on 7.6 acres. Be sure to utilize the ski prep room, and wine cellar during your stay . Truly a uniquely designed luxury estate that will appeal to the masses.